A lot has been going on since I last posted workshops, discussion groups, creative art, filmmaking and promoting. Down Memory Lane work is getting noticed. all the best with this work. 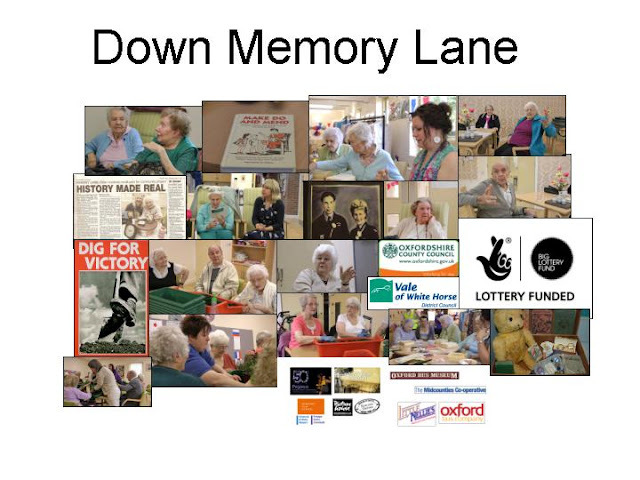 Helen Fountain Reminiscence Officer for the City visited ‘Down Memory Lane’. remembered her time working at the plant during the War when it was an ammunitions factory. Workshops started this month with Artist Helen Jacobs . Felt making with themes from make do and mend. Pupils of St Helen’s also joined in the session as part of the Duke of Edinburgh Awards. through the War years. Thrive looking at the history of gardening and the ‘Dig For Victory’ Jan recalls that when War was declared all the flowers went from the garden and the vegetables came in. Soot was dried from the Chimney to put on the garden along with other products from day to day use. 7) Down Memory Lane - (Remembering the hard facts of War - contains images of concentration camps) We wanted to remember those who survived and those who did not. Thank you to Helen Jacobs and Isla Goldsmith for the ongoing workshops. We will have visits from Cait Sweeney and Nick Gill who will be giving us a sing-a-long as well as looking at the Stars from the Golden Screen. We have objects and memories with Cait Sweeney, Gill Munday – Reminiscence from the County Museums and cinema with screenings of feature films and showing some of the films we have made to date.